Surrrounded by glorious countryside, Much Wenlock is a walkers’ paradise. The Much Wenlock Tourist office have put together a number of walks for you to enjoy and you can download them here. 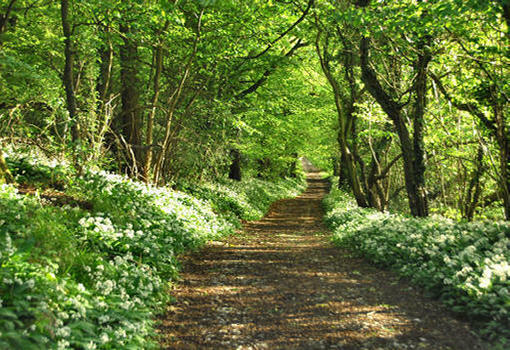 Start with the Much Wenlock Trail, perfect for an afternoon or evening stroll. The walk will take you at least an hour but allow more time if you intend to visit attractions on the way. Download the Much Wenlock Trail here. The Wenlock Rural Walks are five short circular walks which start at the clock tower in Much Wenlock square, opposite the Guildhall and the museum. None of them is more than 5km, and each one can be walked in two hours or less. Blakeway Walk (4km) A long, steep climb up a stony track takes you to the top of open fields, with exhilarating views of hills and fields all around before you come back through a sheltered wood. Brookes Walk (4km) This is an easy, flat stroll, with open views of hillsides and a pleasant walk back through quiet woods along the track of the old railway. Homer Head Walk (4km) You don’t have to go far from the town to walk up to Wenlock Edge, and then along it, with views through the trees to Homer and the Shrewsbury Plain. Perkley Walk (5km) This starts by taking you up a narrow wooded gully, out into open field, and then up a further hill with views of the Clee Hills. You come back down the hill into Much Wenlock, with a long, pleasant sight of the town below you. Walton Walk (3km) This route starts with the climb to Walton Hill, which is steep but is rewarded by stunning views. Then it comes back along the valley, through a range of farmland and woodland. The walks are provided courtesy of tShropshire Council. The Much Wenlock Trail is ©Paul & Sabine Hutchinson, Virtual Shropshire.